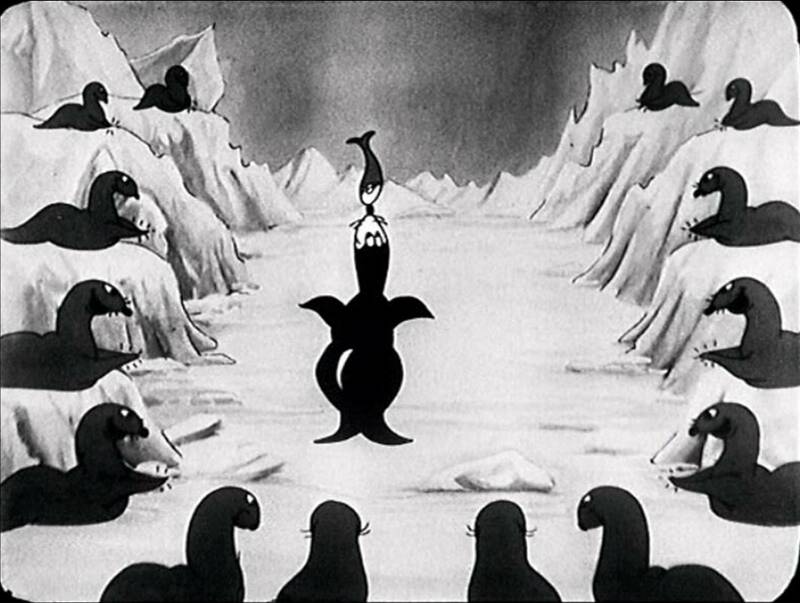 In ‘Arctic Antics’ the song-and-dance-routine, typical of the early Silly Symphonies, is carried out by polar bears, sea lions, penguins (whose habitat actually is the Antarctic), and a walrus. The latter is reused from the Mickey Mouse short ‘Wild Waves‘ from 1929. ‘Arctic Antics’ was the last cartoon Ub Iwerks directed before he left the studio to set up one of his own. It features a rather Mickey Mouse-like polar bear, but the most interesting aspect of this cartoon is the end, in which the marching penguins disappear behind an iceberg. This gives a novelty effect of depth. This search of effects of depth would eventually lead to the invention of the multiplane camera, seven years later. Penguins were revisited five years later, in ‘Peculiar Penguins‘ (1935). By then they had lost the out-of-place bellybuttons they got in this cartoon.